George Romans was acknowledged nationally to be one of the best full-backs of his day, and most commentators believed that his failure to win an international cap was down to his being a contemporary of such an outstanding player as H T Gamlin, and to bad luck – he was selected as a reserve for England on numerous occasions. Nevertheless, George had a very successful career with Gloucester, playing from 1899 to 1906, and as captain from 1900-04, which encompassed 4 seasons and part of another; the club chose George as captain when there were several other distinguished candidates. He was described as a “very reliable full-back” and “supremely successful with his kicking”, to the extent that he converted 344 tries and kicked 29 other goals. His most prolific season was 1905-6, when he scored 152 points. Under his captaincy, Gloucester suffered only 12 defeats in 68 matches. Highlights included doing the double over Clifton in 1900-01 to the tune of 66-0 and 72-3. 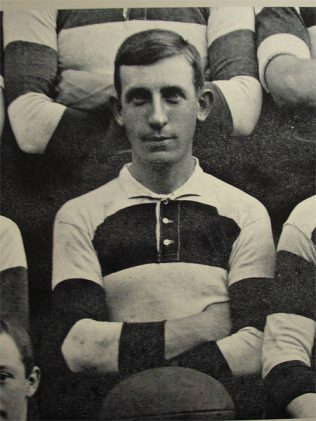 He also led the City XV which beat Bristol in the County Cup final in 1904-05; the heights and weights of the players from both sides in this match were recorded, and it is interesting to note (by comparison with players in recent years) that no player topped 6ft, and the heaviest was 13st 10lb. When his playing days were over, George took up the whistle, and refereed in the local area for many years.